Tired of having puffy bags under your eyes? You’re not on your own. Believed to be a sign of tiredness and stress, anyone (of any age!) can get them. The good news is, there are a number of ways to improve their appearance – including simple changes to your daily routine, home remedies and non-surgical eye bag removal treatments, such as those available at Aesthetics of Essex. How can I get rid of eye bags? Eyebag removal no longer means having to go under the knife. Due to recent advances in the cosmetic industry, non-surgical eyelift procedures – such as PLEXR® – have become an increasingly popular option and they are currently available at both our Essex and Rayleigh-based clinic. PLEXR® treatment is a revolutionary alternative to surgery. It uses plasma to contract and tighten skin fibres in the affected area, getting rid of stubborn eye bags, without damaging the surrounding tissue. The procedure is quick, affordable and less invasive than a traditional eyelift, yet the results are just as fantastic and your eyes will look much more youthful as a result. This is a second non-surgical eyelift treatment that has become very popular. Both dermal fillers and collagen stimulators can be used to successfully reduce eye bags – smoothing lines and wrinkles in the target area and restoring a youthful appearance. It’s a non-invasive procedure with minimal downtime. The results are impressive and you can be ‘eye bag free’ for up to 12 months or more. A cold compress is a simple eye bag treatment that can be done in the comfort of your own home. It’s quick, easy and highly effective. Some people like to invest in a gel eye mask, but a couple of slices of chilled cucumber or potato work just as well. Cover your eyes and lie down for approximately 20 minutes. The cool sensation will help to ease the inflammation under your eyes – reducing puffiness and making your eyes look much brighter and more alert. Step into a local health and beauty store and you’ll find the shelves are lined with countless eye creams – all of which can help to moisturise and improve skin under the eyes. However, it’s worth looking out for products infused with collagen. These are particularly effective. A lack of collagen is often the cause of saggy under-eye skin and, by gradually re-building the level of this protein, such creams can help the target area to look tighter and firmer. They are an easy and affordable eye bag treatment and they can be used on a continuous day-to-day basis. It sounds counter-intuitive, but if dehydrated, your body will start to retain as much water as possible – this can make your eye bags looker bigger and puffier. This is why you should always aim to drink at least eight glasses of water a day and avoid diuretics, such as caffeine and alcohol. Eating a healthy diet can also help to get rid of eye bags. Try to cut back on salt as much as possible, as this can encourage water-retention under the eyes, and be sure to get your five-a-day. 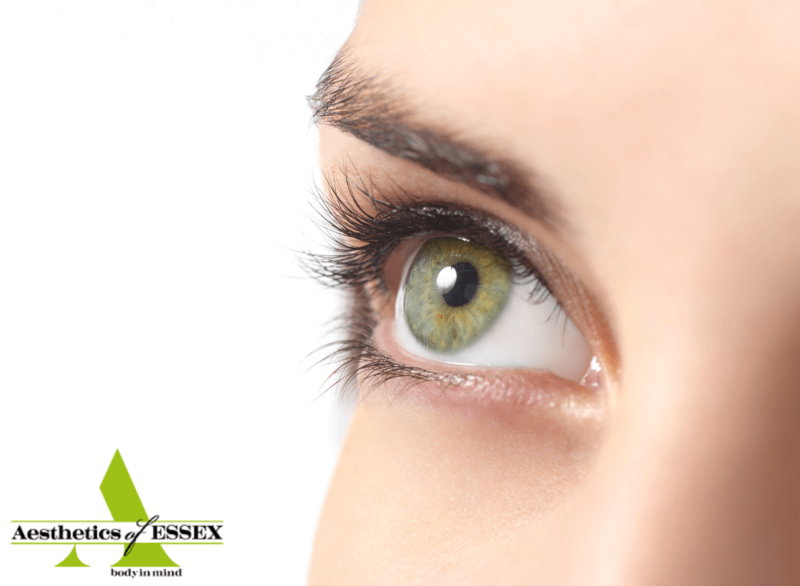 If you would like to find out more about non-surgical eye bag removal and the treatments currently available at Aesthetics of Essex, please feel free to get in touch. Our experts can offer further tips and advice on how to get rid of eye bags and they will help to identify the best option for you – whether that be an advanced PLEXR® treatment, dermal fillers, or a simple home-based remedy. Call us today on 01708 225555 or send an email to info@aestheticsofessex.co.uk for more information.